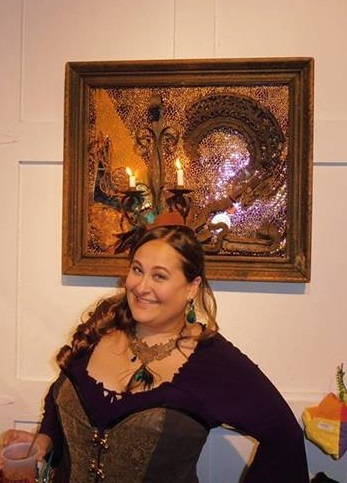 My name is Meghan Davis, and I’m currently an artist living in New Orleans, Louisiana. Since I was very young, I’ve loved art in all it’s shapes and forms. From reading comic books and watching cartoons to studying art history, art has always fascinated me. I graduated from Bethany College, a small liberal arts school, in 2007. There I obtained a Bachelors degree in Visual Arts with a minor in Film Studies. After graduation, I attended The Douglas Education Center. There, I took the Tom Savini’s Special Make-Up Effects program and earned an Associates Degree in Specialized Business in 2008. My skills include sculpting, painting, both beauty and FX makeup, illustration, and face and body painting. Since graduating, I have worked as a professional face painter at several theme parks on the east coast. I also taught Illustration and Art Appreciation for a short period of time at The Douglas Education Center after graduating. I have done freelance work for many different clients, including MTV, Wedding Central, and the AMC Network. I am now a freelance artist, which gives me more time to work on my own art. I’m pretty geeky, and as such a lot of my art draws stylistically from different television shows or movies. I love Doctor Who, the Marvel Cinematic Universe, Steampunk, and other various geekeries. I am also fairly well read, and will often find inspiration in the pages of my favorite novels. Due to my background, my art is never really limited to just one medium. I make whatever I happen to be inspired in at the time, and I hope that other people take as much joy in it as I do! A picture of myself from a recent geek-themed art show.